UNLIKE other varieties of the vestment, the classical chasuble has to be worn in a special way. It is not enough just to settle it on the shoulders. Since the garment covers the whole body, including the arms, it is obvious that these must be disencumbered. 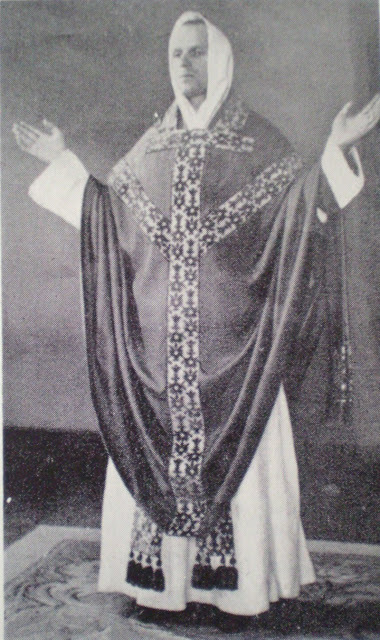 It is the freeing of the arms that causes the pattern of folds characteristic of this type of chasuble. Everything depends on disengaging the arms correctly, in a way that gives the garment the full beauty of its specific "hang", and at the same time gives the celebrant a reasonable freedom of action. The illustrations show the stages in this movement. A few words of explanation may help. Raise and lower the arms gently two or three times somewhat in the manner of a flying bird. This will cause the folds to slide together of their own accord into the angle of the elbows, and will expose about four inches of the sleeves of the alb. (fig. 4). Join the hands. During Mass, the priest's gestures are of course limited to those enjoined by the rubrics. 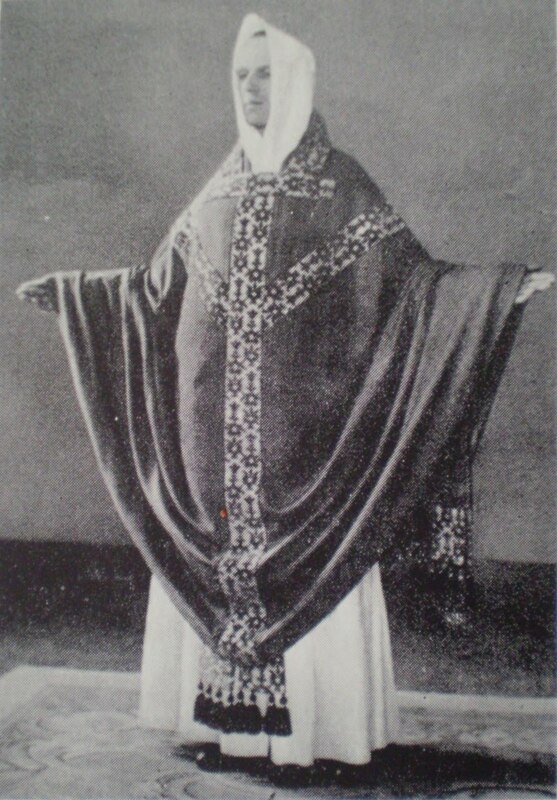 The very shape of the classical chasuble precludes exaggerated movements such as the wide stretching out of the arms either horizontally or vertically, and the lifting of the elbows, especially in genuflections. Instead, the vestment itself imposes the reserve that is required by the ceremonial. The most pronounced gestures of the Massare the elevation of the host and chalice, and if these are made properly, they are perfectly adapted to this chasuble. The same is true of the genuflections. If these are correctly made, the hands being placed on the altar and the elbows kept close to the sides, the chasuble falls gracefully into the beautiful pattern of folds shown in fig. 5. The annoying and graceless dragging which results when these restraints are not observed is shown in fig. 6. 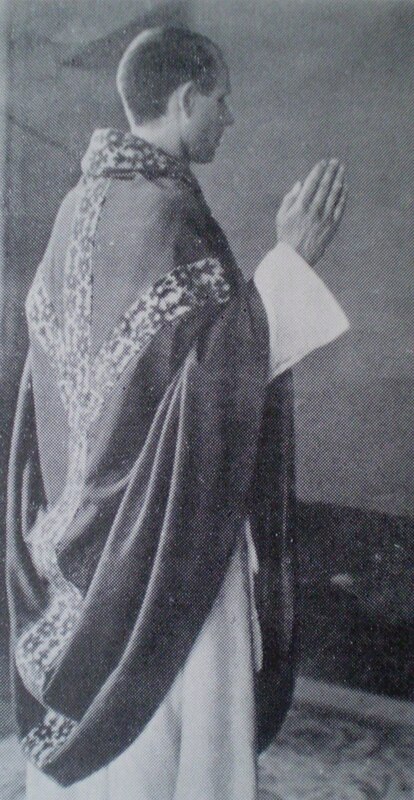 If the chasuble tends to slip during Mass, either on account of the nature of the fabric, or of the lining, or because of the gestures, it may be pushed back into the angles of the elbows. Such slipping is always from front to back rather than towards the hands, as is obvious on account of the conical shape. Therefore the folds must be gathered into the elbows as well as towards the front. Slip the hands under the edge of the garment, leaving the thumb on top. This makes it easy to lift the mass of the material and move it over the elbows towards the front. 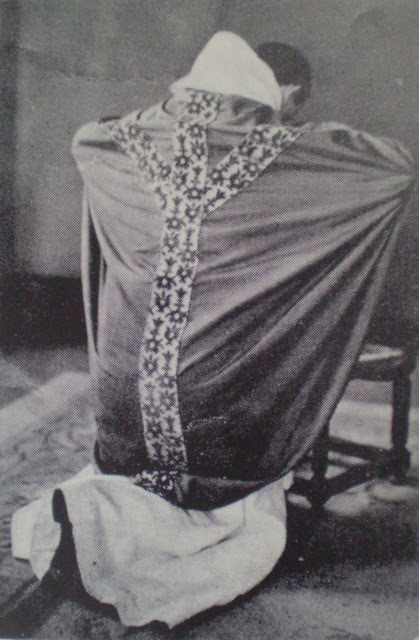 It takes but a short while to learn to put on the chasuble properly, and once this is learned it will be found to move very little. Even when the hands are placed on the altar, its folds stay caught in the angle of the elbows, its edge resting on the sleeves of the alb. 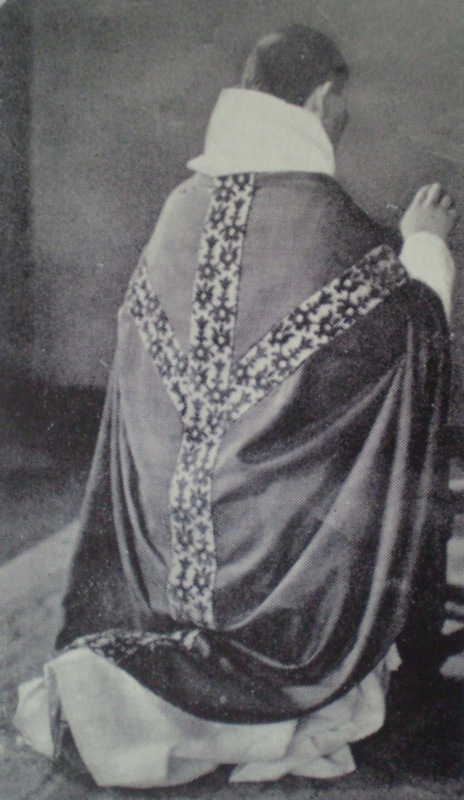 Seen from the back, the chasuble sits higher and lower on the wearer's neck depending on the breadth of his shoulders. (If the shoulders of the cassock are padded it rises especially high and makes an awkward angle. The classical vestment presumes the absence of such artificialities.) The point of the cone -- slightly modified, of course -- comes just at the top of the back. And finally, as to size. 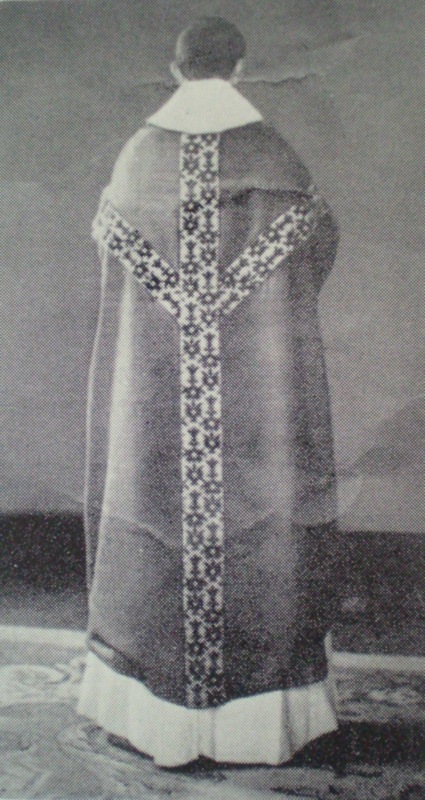 The chasuble shown in the illustrations (cut from the pattern given in L'Ouvoir Liturgique No. 26 and No. 27, 1956) is too large for priests of small stature only if wrongly worn. Well draped and straight, it lifts up enough to be adapted to all figures. 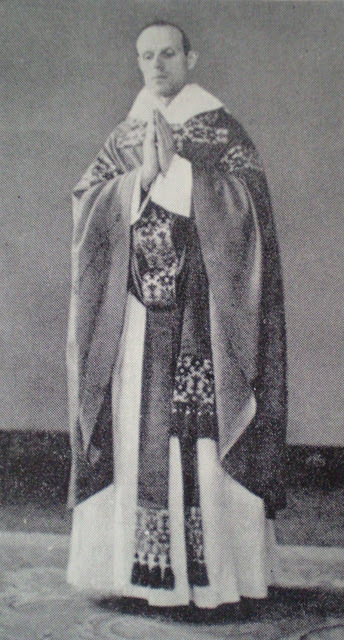 The priest who appears in the illustrations is five feet eight inches in height. 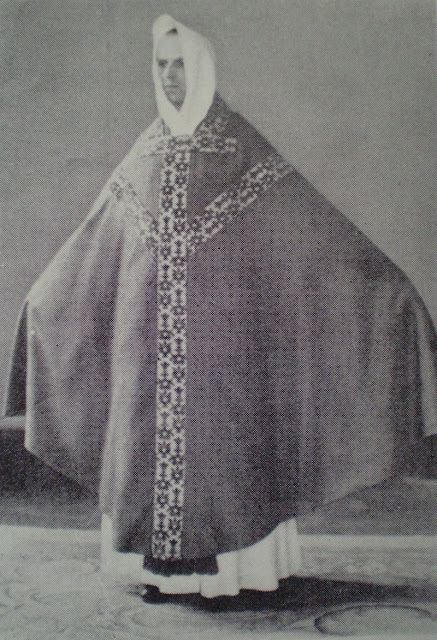 The custom of wearing the amice inside is so well established that we can hardly hope to change it before the general adoption of the classical chasuble. So, for the priests who will continue to fold the amice around the neck the solution is to turn down the top of the chasuble itself. For this it is best to make use of the assistance of another person. The band that surrounds the neck opening makes this easy. The folder over of this band gives a finished appearance to the chasuble with no trouble. (fig. 10) This band takes somewhat the place of the apparels with which the folded over amice may be ornamented. One last piece of advice. It is most important that the alb should reach down as far as possible. 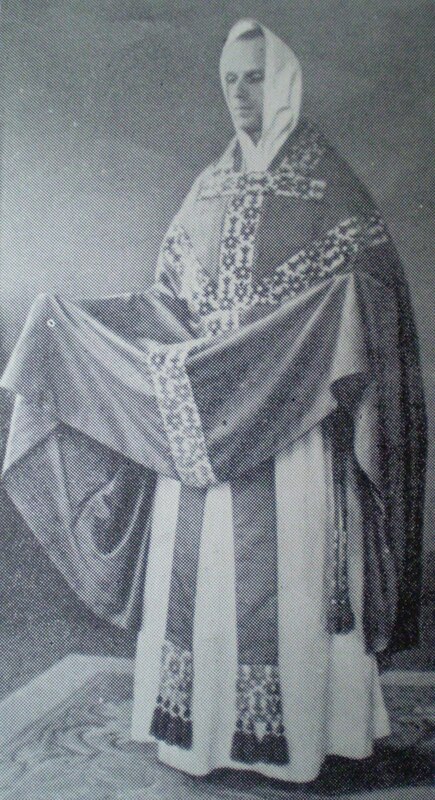 The classical chasuble loses much of its dignity when worn with a short alb. To be exact, the bottom of the alb should just brush the insteps.